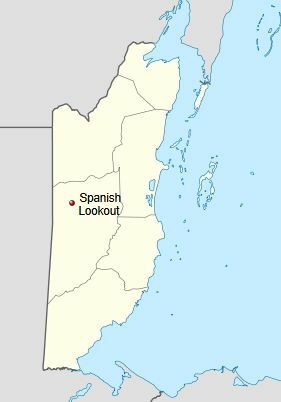 Spanish Lookout, Belize (coordinates: 17.217222, -88.978611 [17° 13′ 2″ N, 88° 58′ 43″ W]) is located in central Belize midway between San Ignacio and Belmopan. In 2000 the town had a population of 1,786. In 2011 it was largely an agricultural community with some light industry, furniture making, prefabricated wood houses and the only oil field in production in Belize, producing 5,000 barrels a day. The town specialized in auto parts and was the country's leader in tire hardware and steel imports. It was a major producer of dairy products, poultry, vegetables and cattle produce, supplying the majority of the country with these products. The producer of Belize’s most popular chicken brand, Quality Chicken, was located at Spanish Lookout. Western Dairy, Belize’s only commercial producer of milk, was also located in the town. The taxation system of Spanish Lookout Colony came with the first settlers from Chihuahua, Mexico. An agreed-upon percentage of the different items raised on each farm was deducted at the collection center, often the local store. Many items were taxed at one percent, others at two percent of the selling price. This applied more to eggs, broiler hens, milk, lumber, garden produce, and cattle. For field crops (corn, milo [sorghum], soy beans, etc.) the farmer was responsible to give a trustworthy answer. A direct tax was also levied on other goods. Two or three days' labor were required yearly of all men over 21 for road maintenance. There were also taxes on land, residences, vehicles, farm equipment, etc. The government collected land taxes through the settlement administration. Income taxes were filed personally. As a general rule, taxes were paid only on items sold off the settlement. Not all of the taxes were started at the same time, but rather as the need arose. No extra tax was charged to families with school children. Everyone shared in the taxes for education. A settlement the size of Spanish Lookout required many different offices, i.e., bishops, ministers, deacons, school board members, teachers, school trustees, song leaders, colony "Vorsteher" (chairman) with two assistants, land committee, road committee, board of directors for cooperative store, and boards for the dairies, clinic, welfare agency, outreach, Waisenamt (orphans bureau, welfare agency), ombudsmen ("Gutmänner"), youth leaders, secretary, cemetery overseer. Kraybill, Paul N., ed. Mennonite World Handbook. Lombard, IL: Mennonite World Conference, 1978: 194-195. Wikipedia. "Spanish Lookout." Web. 23 August 2011. http://en.wikipedia.org/wiki/Spanish_Lookout. Dueck, D. F., John B. Loewen and Richard D. Thiessen. "Spanish Lookout Colony (Cayo District, Belize)." Global Anabaptist Mennonite Encyclopedia Online. August 2011. Web. 23 Apr 2019. http://gameo.org/index.php?title=Spanish_Lookout_Colony_(Cayo_District,_Belize)&oldid=93617. Dueck, D. F., John B. Loewen and Richard D. Thiessen. (August 2011). Spanish Lookout Colony (Cayo District, Belize). Global Anabaptist Mennonite Encyclopedia Online. Retrieved 23 April 2019, from http://gameo.org/index.php?title=Spanish_Lookout_Colony_(Cayo_District,_Belize)&oldid=93617. Adapted by permission of Herald Press, Harrisonburg, Virginia, from Mennonite Encyclopedia, Vol. 5, p. 849. All rights reserved.